The closure is for habitat restoration. BROOKSVILLE – Portions of the equestrian trails at Lake Townsen Preserve will be temporarily closed over the next six months for a habitat restoration project. This project is being conducted by the Environmentally Sensitive Lands program to improve native sandhill habitat for the creation of a permitted gopher tortoise recipient site. An equestrian trail closure schedule will be posted at the preserve’s parking area pay station as well as on the Hernando County website once it becomes available. Several phases of this project have been completed since the Hernando Board of County Commission directed ESL staff to begin moving forward in 2012. Work completed so far includes two mechanical treatments, one chemical treatment and two prescribed burns. For the current phase of the project, the County has partnered with the Florida Forest Service to harvest timber. This harvest will selectively reduce nuisance, overgrown hardwood and sand pine trees while retaining and enhancing growth of native longleaf pines and beneficial herbaceous ground cover. After the timber harvest, the FFS will help county staff in installing fresh fire breaks surrounding the perimeter of the restoration project site to mitigate for potential wildfire. They will also perform a prescribed burn to further enrich the native conditions. The creation of a gopher tortoise recipient site will be beneficial to more than just area tortoises. The restored habitat will provide a more vibrant ecosystem supporting a wider variety of native plants and wildlife. Additionally, county projects requiring gopher tortoise relocations will be less costly, saving taxpayer dollars, and interagency partnerships formed during these projects will carry into the future. Lake Townsen Preserve is a regional park that offers hiking, jogging, biking and horseback riding trails in a densely wooded area, bounded by the state forest to the north and the Withlacoochee River on the east. Visitors can observe the river, cypress swamp, and fish life. The park, 28011 Lake Lindsey Road in Brooksville, also provides access to the Withlacoochee State Trail for walking, bicycling, skating and horseback riding. Located on 37 developed acres and 338 acres of open space in the eastern part of the county, the park has something for everyone – baseball, basketball, volleyball, horseshoes, a fishing pier/boat ramp, and picnic areas, playground, hiking trails and horseback riding trails. For information about the habitat restoration project, call Environmentally Sensitive Lands at (352) 754-4057. 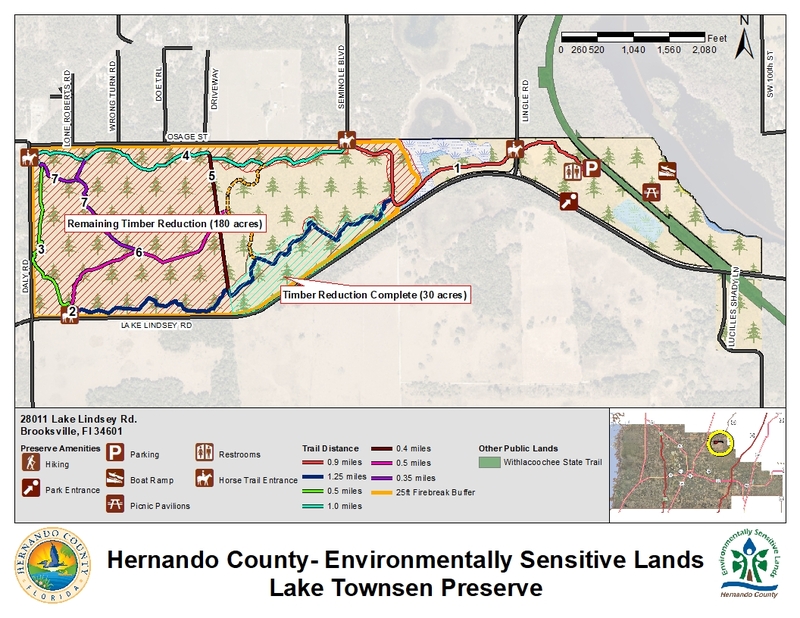 Photo and map courtesy of Hernando County.